When looking for a loft ladder, the FAKRO Komfort loft ladders offer safety and a reduction in the risk of accidents, whilst providing insulation and a subtle design. 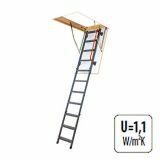 FAKRO LMK ladders come with a white hatch, and a red safety handrail, which is attached to the ladder brackets, increasing ease of use whilst also providing safety. The ladder is manufactured from metal, and the energy hatch is energy saving, and has a 36mm thickness to act as a heat insulator, aided by a peripheral seal. The ladder has a segmented folding system, and the ability to lock the hatch in a fully open position means operation of the loft ladder is easy.